I recently received a sample of the Dylan Blue Perfume by Versace. I have tested other perfumes by the brand and loved them, so I was excited to compare this one! This perfume has a delightful combination of fruity and floral notes. The packaging is eye-catching and elegant. The perfume comes in a rounded glass bottle with intricate, raised golden decals. I love that the bottle has a gorgeous deep blue colour. It feels luxurious and beautiful. I was surprised by how much I enjoyed this fragrance! The blackcurrent sorbet scent is punctuated with tart notes of Granny Smith apple. As the perfume dries down, I detect floral and musky notes. The scent is playful yet sophisticated. This fragrance is long-lasting but not overpowering. I apply it in the morning and the scent does not fade for 4-6 hours! If you’re interested in trying a perfume that is fruity and floral, yet has a musky undertone, I’d recommend Versace’s Dylan Blue! The perfume is feminine yet has a sensual element. The fragrance retails for $106 at Sephora. I adore testing new fragrances. I recently received a sample of Versace’s Bright Crystal Perfume and the floral scent immediately caught my attention. The soft floral notes of magnolia, peony and lotus flower smell clean, refreshing and bright! Versace’s Bright Crystal perfume comes in a sophisticated and elegant bottle. The square shape of the clear bottle enables you to see the pale pink colour of the perfume inside. It features a unique crystal-shaped cap that feels heavy and luxurious to the touch. This fragrance bursts with notes of fresh flowers. Initially, the perfume has a delightful citrus scent that fade to warmer scents of amber, musk and freesia. The combination of sweet and sensual scents blends well together and delights the senses. When this perfume dries onto the skin, it stays vibrant and scented for 3-4 hours. The scent does not last for an entire day, but that is typical of most fragrances. I enjoy how the scent profile changes as the perfume is worn – it starts out citrusy and bright but dries down to a warm, softer scent. The perfume is soft yet vibrant. Versace’s Bright Crystal is a gorgeous perfume to wear daily or for special occasions. The soft, floral fragrance is enticing, calming and sweet. If you are looking for a feminine fragrance that still has a hint of musk, I’d recommend this one! Versace’s Bright Crystal Perfume retails for $126 at Sephora. I received a sample of Chloe’s Nomade Perfume while placing my latest Sephora order. I don’t buy new perfumes often, but this perfume is one of the best that I’ve sampled recently! The warm floral notes of the fragrance are soft and pleasant. Chloe’s Nomade Perfume comes in an elegant rounded bottle that is reminiscent of a hexagon shape. It features a golden cap that glistens when it catches the light. The transparent bottle is made of glass and the light rose-gold colour of the perfume is visible. This perfume bursts with soft scents of freesia and plum. It has a slightly musky undertone when it dries down, but smells sweet when initially applied. The scent is reminiscent of a bouquet of fresh flowers but I can detect a hint of cinnamon in the fragrance. This combination blends together well. When this perfume dries onto the skin, it stays vibrant and scented for 3-4 hours. The scent does not last for an entire day, but that is typical of most fragrances. One aspect of the perfume that I adore is the wearability – it is soft enough to wear everyday. Chloe’s Nomad Perfume is a beautiful fragrance to wear everyday or for special occasions. It is soft, bright, and floral. If you’re looking for a perfume that combines sweet and spiced, I’d recommend this one! Chloe’s Nomad Perfume retails for $154 at Sephora. Smaller bottles of perfume are available, priced at $86 or $122. DISCLAIMER: I received samples of Kat Von D Saint and Sinner fragrances from Influenster for testing purposes. If you’ve followed my blog for a while, you’ll know that I adore Kat Von D products. I own multiple products from her collection, including the Tattoo Liner, Lock-It Foundation, and Everlasting Liquid Lipstick. When Influenster reached out to me to test Kat’s new Saint & Sinner perfume I gladly accepted. Both perfumes are uniquely packaged. 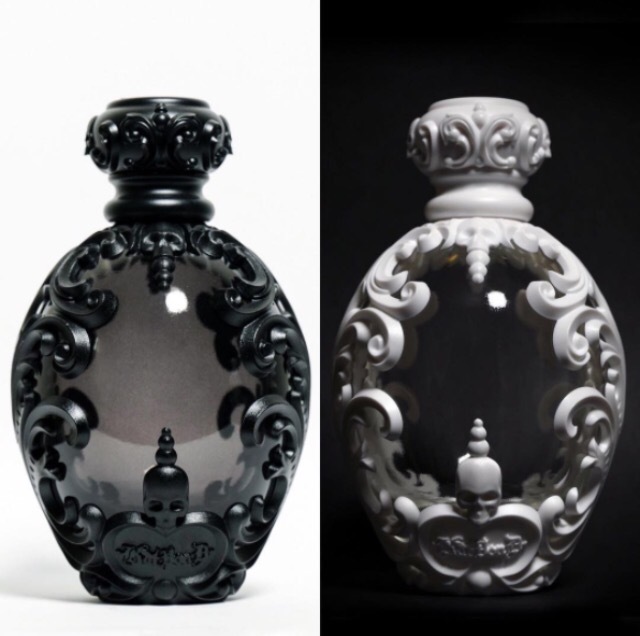 The outer boxes containing the perfume contain a swirling, gothic design with the Kat Von D logo written on the front. The Saint perfume comes in a white box, with the word Saint written in gothic, white script. The Sinner perfume comes in a black box with the word Sinner written in the same script. This design is edgy, yet chic. Each perfume bottle is elegant and classic. The bottle tops are rounded and ribbed. Both bottles carry the same colour palette as the outer packaging. This scent is my favourite of the two. It is floral with hints of musk. The scent profile contains jasmine with hints of vanilla, sandalwood and caramel. Saint smells caramel-sweet when first applied to the skin, then dries down to a soft, bright vanilla. Sinner is noticeably muskier than it’s sister scent. The scent profile is reminiscent of pungent spice. Key fragrance notes in this perfume include wood and cinnamon. Sinner smells lemony with hints of spice when first applied to the skin. It dries down to a musky-cinnamon. Because each bottle is sample-sized, it does not contain a sprayer component. I gently pour the fragrance onto my neck, behind my ears, and onto each wrist. Each scent lasts for 3-4 hours after initial application. Each scent retails from Sephora or KatVonDBeauty.com The full-sized bottle (3.4 oz/100mL) retails for $115, while the smaller bottle (1.7 oz/50mL) costs $88. This perfume is also available in a roller-ball format for $30. I search for a new fragrance every few months and vary the scents I wear based on the season. I found Viktor & Rolf Flowerbomb Perfume at Sephora. Upon testing the fragrance, it reminded me of spring. Viktor & Rolf are an Amsterdam-based design team. Flowerbomb is their debut fragrance. 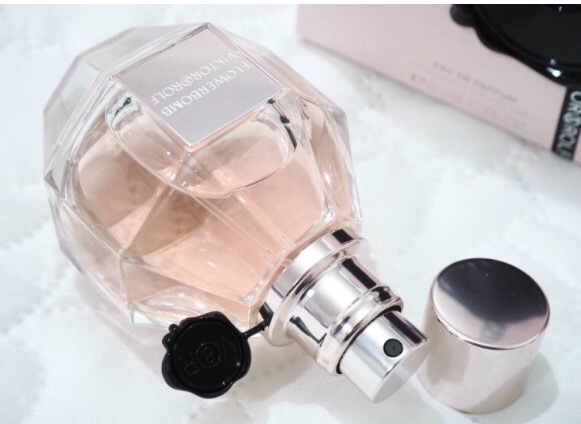 The glass bottle containing the perfume is octagon-shaped. Inside the bottle is the pale pink perfume – the colour of a peony. The geometric pattern on the bottle is fun and unique. Like other perfume bottles, this one contains a spray nozzle. Flowerbomb is a delightful combination of floral notes. I sense hints of jasmine, freesia, and rose. The scent is mildly floral, but not overpowering. The fragrance begins with hints of rose and citrus. It dries down to a sweet vanilla scent with light jasmine notes. I often avoid flower-scented perfumes. This one, however, is mild for my liking. The perfume is long-lasting. It reveals different fragrance notes as it dries down. I enjoy the scent. Floral perfumes are often cloying and overpowering. This one is the opposite – light and mild. This fragrance is is just one of the company’s perfume sets. Other perfumes available in Viktor & Rolf’s collection include the Bonbon Collection and the Spice Collection. Viktor & Rolf’s Flowerbomb Perfume retails at Sephora for $195.